Designers collaborating with artists on collection pieces, advertising, and store design is quite common nowadays. 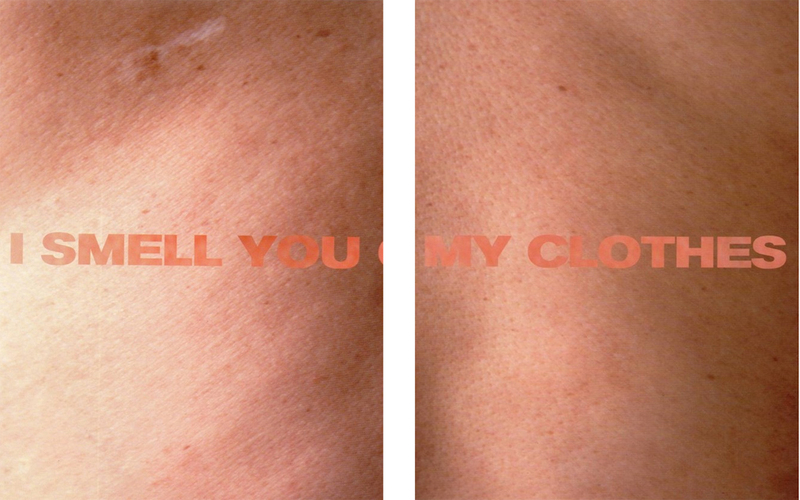 When Helmut lang and Jenny Holzer first came together to create ‘I Smell You on My Clothes’; an installation for the 1996 Florence Biennale, it wasn’t. In a constructed space, Helmut Lang pumped in a fragrance meant to evoke the scent left by a lover on the sheets. Jenny Holzer produced a LED sign that displayed possessive proclamations: ‘YOU ARE THE ONE’, ‘YOU ARE THE ONE WHO DID THIS TO ME’, ‘YOU ARE MY OWN’. United by their similar approaches (described by Holzer as ‘a little mean, and less-is-more’), their work together disturbed the boundaries of fashion, perfumery, architecture and art, raising the bar for future multi-disciplinary collaborations. Two years later, when Helmut Lang relocated to new york and opened his boutique / art gallery they collaborated again. The white space wasn’t immediatly recognizable as a store. The cash registers were hidden from sight and the giant black cabinets revealing the designer’s clothing upon passing. One of Holzer’s LED pieces took centre stage, repeating monosyllabic messages. For his specialist perfume store and the launch of the brand’s first fragrance in 2000 Lang teamed up with Holzer once more. With no product shots and a tiny logo, the iconic anti advertising campain, produced with support of art director Marc atlan invested in the conceptual rather than the commercial. Lang and Holzer’s work rejected convention, making viewers question the lines between commerce, art and high fashion.